Today’s Book of the Day is a Romantic Suspense novel by bestselling author,Rachelle Ayala, and it’s 67% off for a very short time. Broken Build has a 3.8 star rating and is on sale for only 99 cents – save $2! 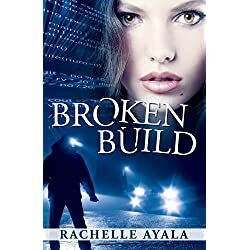 Broken Build is an exciting story full of twists and turns, murder and deception, with a steamy romance. Ms. Ayala has done it again by creating another riveting tale sure to keep you guessing! The main characters are multi-faceted and overall deeply conflicted.Murder, intrigue and unknown people keep you on your toes while maintaining a quick paced storyline with a deep seeded romance. A great read, hard to put down. Fast paced and mysterious–a page turner to the very end! Broken Build offers several twists and turns that leave the reader guessing. Highly recommended! This is the second book I’ve read by Rachelle and it did not disappoint. A fun thrill ride of suspense will keep you interested and addicted. I read this book in just a couple of days, I couldn’t put it down. If you’re looking for a great Romantic Suspense book you have to read this one. This book was every kind of book I enjoy all wrapped up into one. I stayed up late to read it and my hubby could barely even capture my attention. Kept me guessing and was awesome! I will be reading more from this author for sure!